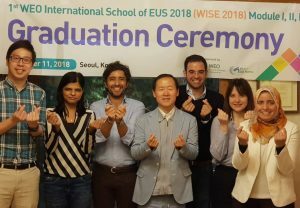 With the completion of their third module in October 2018, participants in the first International School of EUS (WISE) 2018 successfully finished the program. We are now very pleased to announce WISE 2019, which will once again be held in Seoul, Korea. WISE 2019 is directed at endoscopists in their early careers who will be selected from a diverse pool of qualified candidates who wish to improve their skills in EUS practice. Professor Dong-Wan Seo, the course director, expects selection of a larger group of doctors for this second course. Participants will have specialized lectures and intensive hands-on training sessions with live models, using the most innovative technology. After each module, participants will be able to present their own cases and receive expert feedback via international web conferences. WEO is very grateful to the Korean Society of Gastrointestinal Endoscopy (KSGE) for their continuous support for this initiative. The first module of WISE 2019 will be held on June 8th to 15th , 2019 in combination with the International Digestive Endoscopy Network 2019. The second module will take place from October 5th – 12th , 2019, in conjunction with the EUS Summit 2019 & Society of Gastrointestinal Intervention 2019. Candidate application is now open via the WEO website.